No online casino would be whole without a sufficient number of bonuses and special promotions. Leo Vegas understood this very early in the game, and has hence attracted people from all parts of the globe. Since there are only two sections at Leo Vegas (casino and live casino), you will always find great offers to suit your needs. Competitions, tournaments, special promotions, customized bonuses and welcome packages for new players – Leo Vegas has it all. They will give you a welcome bonus with your 4 (four) first deposits! How awesome is that? First you get up to 100 euro and 50 free spins. Then up to 500 euro and 50 free spins. Then another 500 euro and 50 free spins, and finally up to 400 euro and – you guessed it – an additional 50 free spins. That’s 200 free spins in total, and up to 1500 euros in bonuses! Get ready for a real feast when you browse through the game selection at Leo Vegas. More than 600 different games await you, all in different colours and with different themes. 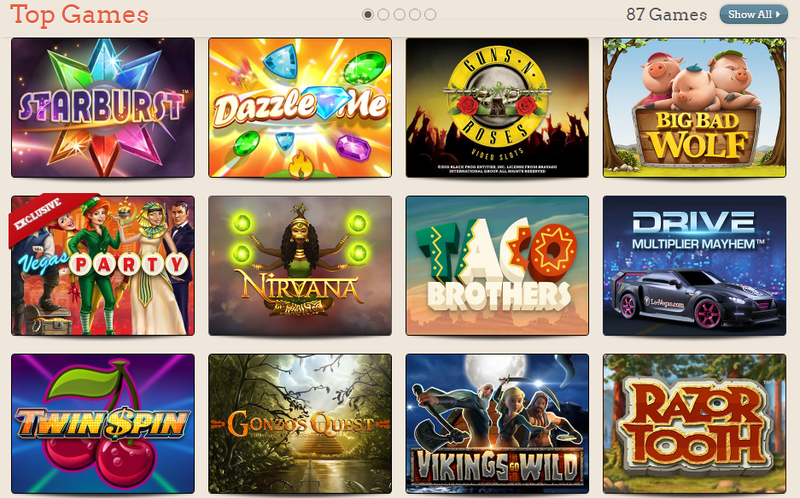 Video slots is the biggest category, boasting almost 500 games alone. No matter what kind of slots you prefer, Leo Vegas will give you a vast selection. If you, however, prefer more classic-type games, Leo Vegas has them as well. Blackjack, roulette, baccarat, casino Hold’em and plenty of others are all available both from your desktop and from mobile devices. This is why the bonuses are so important – you need as much money as possible in order to play yourself through such a wide variety of games. And do not forget those 200 free spins. They might just give you a few million euros! The casino lobby looks awesome, with big logos representing the different games available. Most of the games have been categorized into different themes, like “Lost Treasure” and “Classic Slots”. The top menu is easily apprehensible, as you simply choose the type of games you prefer. But you can also scroll downwards on the main screen and see all the games appear before you as you go. On top there is also a big banner showing you the latest, coolest slot machines available. Live games are also offered, with a decent selection of live casino tables available around the clock. So get to it! Leo Vegas is user-friendly and mobile-friendly; hence, all payment options need to be versatile. There might not be as many different options as in other online casinos, but the advantage is that they all work brilliantly from your mobile phone or tablet. VISA, MasterCard, Skrill and Neteller are the most popular payment methods. The first two are regular bankcards which most of us own, while the latter are online wallets. Withdrawals are processed in a timely fashion, and if you choose to receive your money in a bank account, the modern service called Trustly will make sure that every cent arrives within 24 hours. As we mentioned from the very start, Leo Vegas has grown substantially in a short amount of time. This is very much due to their customer service as well as their availability and versatility. Customer service is available around the clock, and you can call, write e-mails or use the live chat with ease. They also have an extensive FAQ that should answer most common questions. The customer service is multilingual, and all replies are both friendly and professional. Two thumbs up for this perfect blend of an online casino!